I've completed the mountains on my continent. The eraser tool is definitely as important as the airbrush tool. 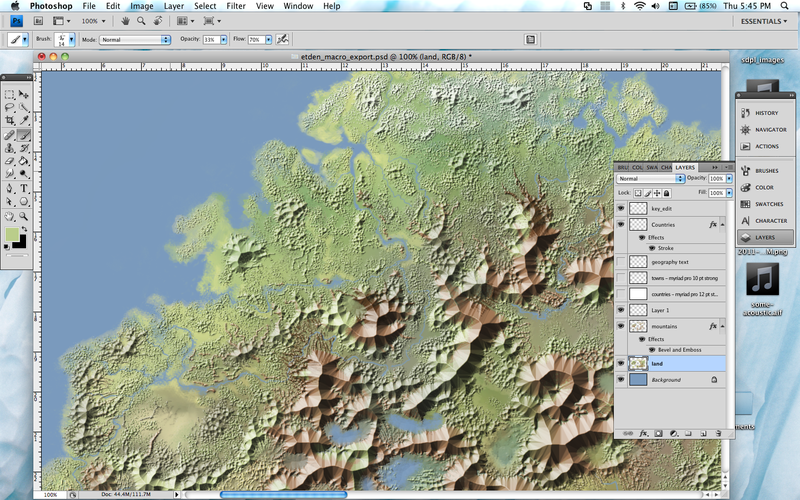 The layer properties I use in photoshop to get the mountain effect can sometimes resolve very strange designs, i.e. blatantly geometric shapes. The answer seemed to be subtracting small swirls and clicks with a brush shaped like pixelated noise with style. I've spent a bit more time on the land layer, which is the part underneath the mountain layer and above the solid blue background layer. The land layer, when subtracted in small, snaking airbrush lines produces the watershed. The coast receives special attention, including 20-30% transparent airbrushed strips of "sand" and erased inlets, lagoons and other coastal terrain features. Trade routes will be coming soon; the caravans would follow--like the rivers and lakes--the contours of the mountains I've finished, taking the paths of least resistance.